Alcoa Wheels are the perfect solution for daily transport needs. Suitable for all types of vehicles and with a far superior performance than any other type of wheel in the market; regardless the environment. In order to make sure these wonderful babies are kept in the best possible condition ensuring you a long service life the company added Alcoa Accessory Products to its current portfolio. An impressive line featuring special cleaners, high quality greases for hub bore and valve hole area and shiny nut covers. Everything you need for properly treatment of your Alcoa Wheels. Dura-Bright® Wheels Wash is one of the highlights that was recently introduced. It’s a special cleaner developed for Dura-Bright® treated wheels. Suitable for weekly use and perfectly safe as you don’t need to dilute the product. 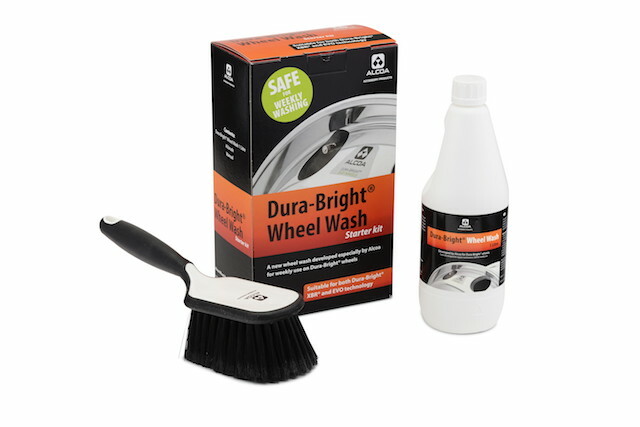 Dura-Bright® Wheels Wash helps to prevent the buildup of brake dust resin and copper glow. It’s the only cleaner developed and approved by the company. Dura-Bright® Wheel Wash can be purchased through the official Alcoa Wheels distributors. Want to give it a first try? Then choose for the starter kit. It contains a one litre bottle and an ALbrush. For regular and heavy users the options are either a 5 litre container or a 25 litre container. If you want to sparkle on the road Dura-Bright® EVO Alcoa Wheels are just it! Beautiful, shiny wheels that increase the vehicle’s payload, are 5 times stronger than steel wheels and are long-lasting making them a moneymaking asset. Dura-Bright® is a special patented surface treatment that penetrates the aluminium and forms a protective shield that becomes one with the wheel. Unlike ordinary aluminium wheels it doesn’t chip, crack, peel or corrode. For more information about Alcoa Wheels and Alcoa Accessory Products visit the website www.alcoawheelseurope.com.